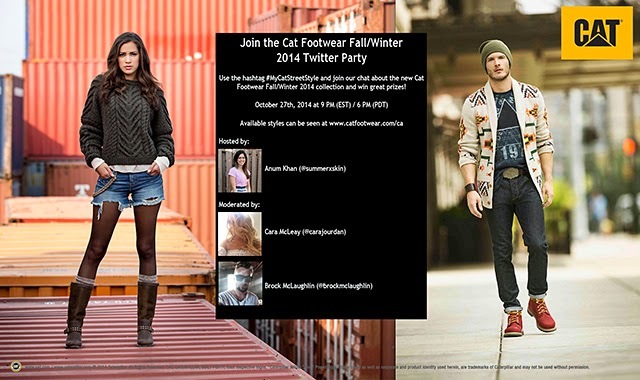 If you're looking for ways to refresh your wardrobe this season, join me and Cat Footwear for Twitter Party on Monday, October 27, 2014 at 9 p.m. ET! We'll be talking about fall fashion, upcoming trends for the colder months and giving away incredible prizes throughout the hour that you don't want to miss out on. I'm super excited to be the official host for the #MyCatStreetStyle Twitter Party! Be sure to follow me (@SummerxSkin), @CatFootwearCAN and bloggers @CaraJourdan and @BrockMcLaughlin as they moderate it with me. Please make sure to RSVP for #MyCatStreetStyle Twitter Party by using the link above. We will use this tool to pick winners that evening. In the "Link Title or Blog Title" section, write your Twitter handle, and for the "Link", you can paste your Twitter link.